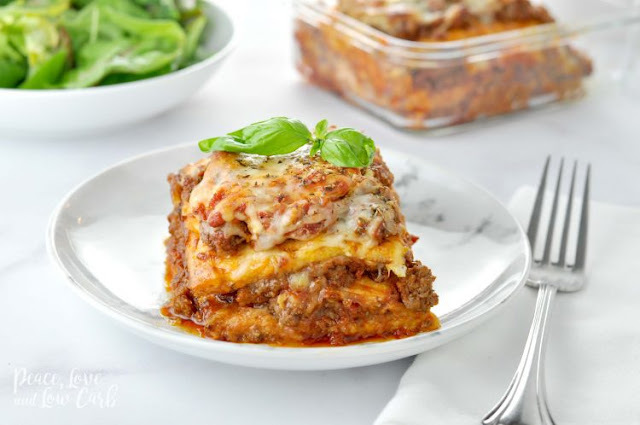 This low carb keto lasagna recipe is easy to make and tastes just like the real thing. In fact, over the years, I have been told many times that it should be called “Better Than the Real Thing” lasagna. When I was first starting a low carb, ketogenic lifestyle, I really wanted a low carb and gluten free pasta substitution. But at the time, they were really hard to find, and the keto pasta recipes that I could find, we just plain no good! I was tired of wasting food trying low carb recipes that fell flat. Sound familiar? I knew I had to set out to make my own low carb, real food versions. There were two recipes that I immediately knew I wanted to make – a low carb mac and cheese and a low carb lasagna. So, I did exactly that. They were two of the very first recipes I ever wrote for this site and 6 years later, they are still among the most popular. This part will take the longest, so feel free to make the “noodles” the night before and just leave them in the fridge until you are ready for them. In a large mixing bowl, using a hand mixer, cream together cream cheese and eggs. Next, add Parmesan cheese, Italian seasoning, garlic powder, and onion powder. Mix until all ingredients are well combined. Using a rubber spatula, fold in mozzarella cheese and mix until well incorporated. Spread the mixture into the baking dish, forming a nice even layer. Bake on the middle rack for 20-25 minutes. When the “noodles” are done baking, cool in the fridge for about 20 minutes and then cut into thirds. This makes three perfectly sized “noodle” layers for an 8.5 X 4.5 X 2.5 loaf pan. In a large skillet over medium-high heat, combine ground beef, minced onion, oregano, garlic powder, dried basil and a pinch of salt. Cook until the meat is browned. Drain excess fat from pan and add ¾ cup marinara sauce to meat. Reduce heat to low and simmer for 10 minutes. Layer a third of the ground beef mixture. Top with ¼ cup mozzarella cheese and 3 tbsp ricotta cheese, and cover with another “noodle” layer. Repeat these steps. Cover the top “noodle” layer with remaining ground beef, and mozzarella cheese. Sprinkle Italian seasoning over top. Bake for 20 minutes. 0 Response to "“JUST LIKE THE REAL THING” LOW CARB KETO LASAGNA"